Now you've arrived at the most important article of the Chatbot: personalization and configuration! Trengo's Chatbot can be personalized to suit the needs of each individual company, so that it fits in with your business situation 👐🏻. By clicking "Settings" in the Chatbot menu all possibilities that can be personalized are loaded. Firstly, give a clear "Title" to the Chatbot for internal use. It may be that you want to use more Chatbots for the company in the future. We've given the Chatbot a fantastic name, namely Buddy! Under "Content" you can find all textual information on what the Chatbot says in a number of scenarios. An example of this is the introductory text "My name is Buddy and I am the chatbot of [company name]". Since the Chatbot becomes smarter and smarter due to adding information and isn't always able to answer the question, we advise to give the Chatbot a playful name and not a name that resembles a name of a person. This is to prevent irritation and to clearly distinguish between man and Chatbot. Of course you can also just call Buddy: Buddy 😉! In the block "Advanced" under "Settings" the most important advanced settings can be found with which the difference can be made in the own adaptation and the operation of the Chatbot. If the Chatbot cannot answer the question (several times), he'll forward the conversation to the service team. If this option isn't enabled, the visitor will always keep chatting with the Chatbot, and there'll never be an employee able to intervene (this could possibly cause annoyance). The Chatbot keeps track of how often it doesn't know an answer to a question (in order to avoid irritation). By keeping the failure limit low, the Chatbot will refer a question to the team more quickly. The Chatbot tries to understand more complex questions. These can be multiple questions in one question, separated by periods and commas. Often a more complex question is equipped with Small Talk and at the end of this message, the question is asked. By setting the "Partial answer failure limit" to be higher than the "Failure limit", the Chatbot will still be able to respond to more complex questions and returns what it understands and has not understood in the conversation. In this way it can answer a part of the question/context. This is often the most important issue in the question. 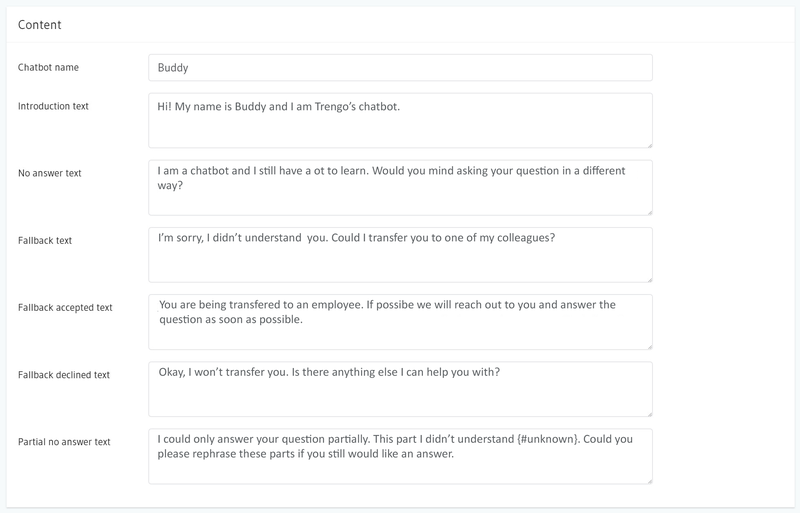 If the Chatbot reaches the failure limit, it's possible that the Chatbot asks whether the conversation may be referred to an employee during a conversation, in order to have the latter answer the question. If the visitor wants this and thus confirms, the conversation is referred to the team. If this option is turned off, this is not requested and the conversation is immediately reffered to the team. The higher the answer confidence percentage is, the more certain the Chatbot must be if it answers the question. We advise you to set this percentage to 70% and possibly increase this in the future. This means, however, that the Chatbot often informs the visitor in the initial phase that it doesn't understand the answer. A lot of information is not yet accommodated and added to the Chatbot initially. A high percentage prevents the Chatbot from giving a wrong answer. The Chatbot can be perfectly trained and deployed by referring conversations to an employee more quickly. Are you satisfied with the settings of the Chatbot? Then continue discovering - and trying it in the Playground. Do you want to make adjustments to the Chatbot later on, even if it's already active on a channel? No problem, once you make adjustments and save them, the changes are effective immediately! It's possible to make the Chatbot barely noticeable and visible if it has no answer to the question asked. This can be done by reffering the question to an employee directly. This way the visitor is immediately forwarded to a team with the question (as you are used to). These types of "misses" are always registered in Trengo. In this way, during the initial phase, the visitor will experience no strange things and your organization can perfectly complement the Chatbot with missing information. Set "Agent fallback" to "Active (green)", "Failure limit" to 0, "Partial answer failure limit" to 0 and "Agent fallback confirmation" to "Inactive (gray)".